﻿ "Same cost as a 1098"
If you are interested in my bike here is a short brief I wrote for the Yamaha R1 forum. 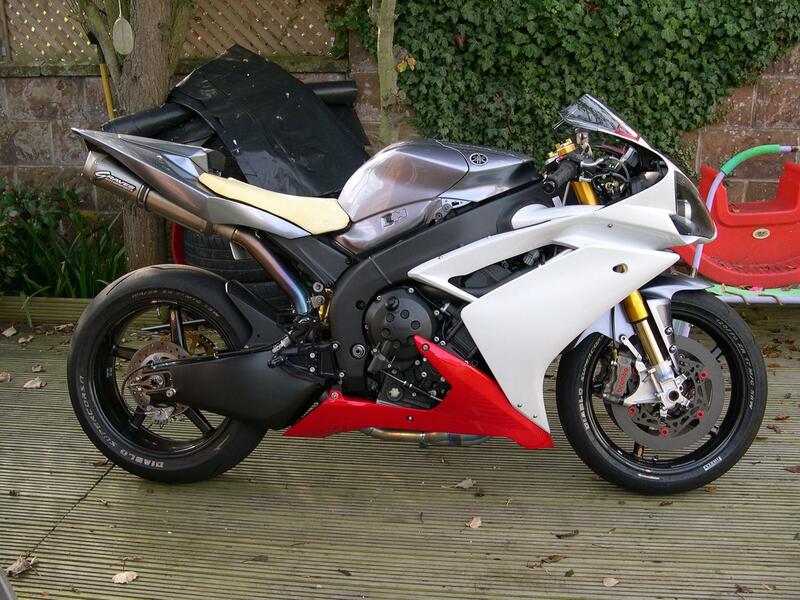 The whole idea was to make a trick R1 to the same cost as a Ducati 1098s (£11500) in the UK. But to have more power and more torque. I was fed up with all the mags and people saying the 1098 was the thing to have so wanted to show you could have something better for the same amount of money. Additionally I wanted to make her look a little different but retain the R1 appearance. Hence she is a 2005 model R1 wearing 2007/8 front bodywork. As previously mentioned, the idea was to make as trick an R1 as possible but within the budget. I based my 2005 R1 value at £5000 so effectively had a ceiling of £6500 to spend. I didn’t have this money but by buying from around the world from R1 forum members and e-bay and other contacts gained over the years I knew I could save here and there. I also had the bits which came off the bike to sell and offset purchases. Some items I already had. First major purchase was the BST carbon wheels. I got them at a good price. A little saving was made by talking to the vendor, Bike HPS, and the deal was done. Next came the Ohlin’s forks and rear shock which if memory serves came from an r1-forum member. At the time of purchase the $/£ rate was in my favour. I had another deal for the Graves Ti system and a power commander with ignition unit. All in all I saved around £1100 Uk. I made a contact through e-bay and then dealt direct with a guy involved with AMA. His name is Lee Foley and he has helped me with some great deals. I got the Brembo upgrade kit and the Axis ceramic discs through him along with later style end cans for the Graves system. All in all I saved enough to buy the discs compared with UK prices! Those on the forum will know how much these cost so you can see why I bought state-side! From my earlier amateur race background, I knew who I wanted to work the engine. Bob Farnham is a well known engine tuner and builder with a vast history of success. We discussed the project and agreed a price and the deal was done. The bike stayed with Bob until complete. Meantime, I saw a race radiator and wondered would it fit. I spoke to Bob and he said it would definitely help the cooling side of things as this was going to be quite a powerful build. Initially, the radiator was going to come from Phase 1 Endurance but Bob put me on to a guy called Pete Beale. I knew the name as I had raced in a couple of meetings where Pete and I had been in the same race. He was at the front and I was most definitely at the back! Anyway Pete was called and I went to meet him and a deal was done for another race radiator and a YEC exhaust cm and race rotor. This lot immediately went to Bob the tuner to be fitted and then the engine could go for final mapping set-up. Around April 08 a trip to WSB Assen was arranged. I now had the bike at home but had a serious problem with the radiator. It had come from a 07 BSB race bike and would not fit my standard bodywork. The decision was made to run the standard radiator for the trip. 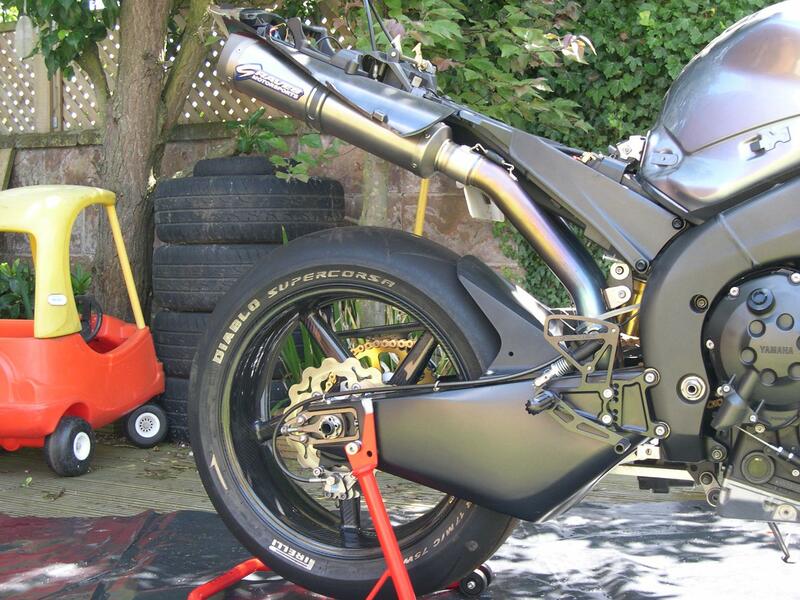 After fitting the standard radiator the bike was taken for its first road test after tuning. I took my mate Andy with me in case something went wrong. Andy has an identical 05 R1. He rides very similar to me so I knew we could get a good comparison between standard and tuned bikes. On the ride out the road we usually take is quite fast with lovely flowing high speed corners and a bit of a straight, a kind of corkscrew type corner and some other nice stuff thrown in too. Though there was no race involved it was clear to me that the bike had masses of extra power but remained linear in delivery. Just real smooth all round. We had come to the end of our windy road and proceeded onto a dual carriage-way which I want to use for a side by side roll-on test. Unfortunately we found this to be a little damp from an earlier shower but proceeded to continue. We made our minds up to go through with the roll-on and at our marker did the roll on test. Both bikes were side by side at 6k in top gear. We rolled on and Andy’s bike pulled a bike length ahead then my bike came on cam and just pissed past him. I was happily amazed. Then at 8krpm she just lit up the back tyre. I had done no more than roll the throttle and she was spinning up...In top! I was smiling like the cat that’d got the cream! Andy couldn’t believe what he heard and saw. We went off home where I then continued to get her ready for the Assen trip. The trip to Assen was non eventful other than a visit to Ten Kate Honda workshop. Very enjoyable but sadly all the bike were at Assen. However, whilst leaving Ten Kate I heard a couple of clicks from the engine but thought nothing of it. I caught up with my friends on their bikes and later on whilst returning to our hotel did a top speed run. This was to prove decisive. Up until this point the bike was an absolute missile. On the top speed run she was registering 189 at 11500 rpm and was still pulling before I ran out of space! I was amazed. Flat out with loads more pull left… but then… disaster. The engine coughed then coughed again and then died. Subsequent investigation showed the engine had detonated destroying 1 and 2 pistons completely. Since then the bike has gone back to Bob and been reworked and rebuilt. That’s where the saving made on parts comes back into the equation. Pete Beale, the engine tuner for RM Racing formerly Virgin Yamaha, had spare pistons and barrels so I could make the repair. She hasn’t been run hard since April. This time a new, modified Bora radiator has been fitted. She has the standard fans fitted so cooling should not be part of the equation. I’ve ditched the ignition unit on other peoples advice. The bike will go for a full re-map shortly so I’ll be able to see if any loss in power has occurred. During the off road time I have been fitting other bits and pieces. New callipers, discs, brake lines and a front 07/08 fairing went on. 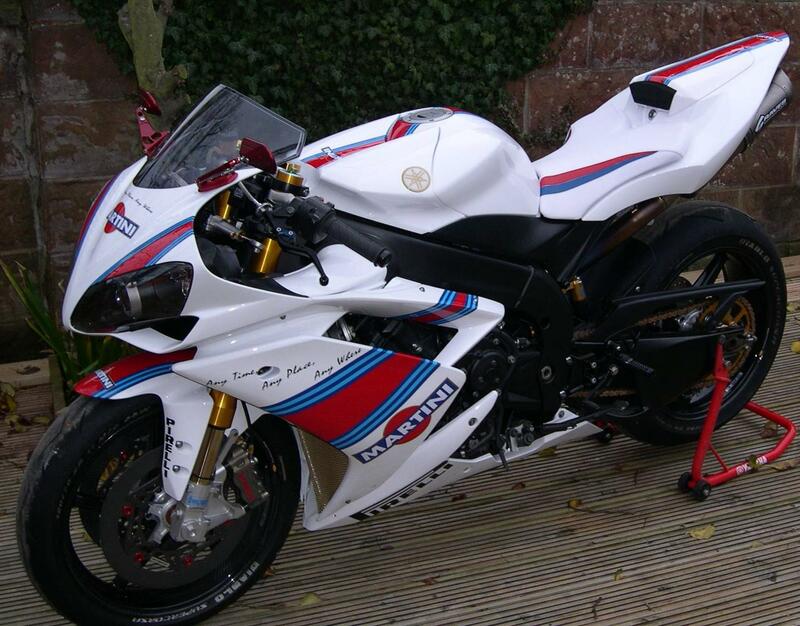 I did a deal with a friend, Chris Smith, who is going racing in 09 on an 07 R1 for his standard bodywork. Everything, except the tank. The fairing was mint. The surplus items not used went on e-bay. Although slightly similar looking, fitting the 07 fairing was definitely not as easy as it sounds and took a lot of persuasion. This went on so as to fit the 07/08 Bora race radiator. I’m really pleased with the way it turned out but being a perfectionist will never be truly satisfied. Some bits will have to remain off the bike due to the radiators size. The bike also went to paint and took what can only be called, forever to complete. Having said that I am over the moon with the way my thoughts were interpreted by the painter. It looks beautiful up close. A seat cover was made to my design by Luimoto in Canada. They sent me some colour samples and I made the colour choice based on what I thought would be correct. The colour match came out at what I would say is 95%. That is as close as I think would be possible and was made before the paint went on the bike so pretty damn lucky. The seat was modified as per the seat mod thread in the R1 forum archives and then covered by Gary, an upholsterer neighbour of my mate Andy. All in all the colour match turned out pretty damn good. At the time of writing I’ve been getting over the flu. Not a great deal has happened but winter is a perfect time to build your dream bike. No mad rush to get out there and play! A few little bits to go back on and she’ll be complete. The budget has been exceeded but I have a load of stuff which came off the original bike still to sell. The last lot of stuff I e-bayed sold for £1200. I have a complete set of 05 bodywork, wheels, swing arm, brakes, clip-ons, forks, foot-rests, exhaust, ignition unit, power commander, discs etc, etc. the list is endless. All that stuff will go on e-bay or elsewhere to offset the outlay on the build. I know what she cost and am 100% confident that when all the other stuff goes, will have my “same cost as a 1098”. If not, there’s always the 1098RR..! So far the engine is making just under 180Hp (176.6) torque is at 85lb.ft The engine has been worked by Bob Farnham in the UK. Additionally, she’s had the following bits added She's had the head work and runs YEC kit ex. cam plus YEC kit rotor Modified barrels Graves full Ti system Graves velocity stacks Graves smog block offs Dynojet Power Commander Dynojet Quickshift ACTIVE Quick action throttle Venhill braided look cables made to measure BORA race radiator to BSB/WSB spec modified to take standard fans, Yamaha 2007 R1 standard front bodywork DPM mirrors Lockhart Phillips signals Ohlins front and rear suspension Ohlins damper BST carbon wheels Modified std swing arm AP racing rear under slung calliper on Brembo carrier Brembo monoblocs Brembo 19RCS adjustable m/cylinder with modified Brembo shorty folding lever Brembo clutch reservoir as brake reservoir HEL hoses F&R BrakeTech AXIS ceramic matrix discs Pazzo clutch lever with Venhill braided look made to measure clutch cable STM slipper clutch 520 chain conversion Gilles adjusters Gilles Ti axle nut Vortex rear-sets Gold anodised spin off filler cap Home made stone guards The rest of the list is smaller stuff but it all counts. On order are a set of Promach adjustable offset Triple clamps.